Mitsubishi FTO - J's Garage Export Co., Ltd. There are three type engines in the FTO line : GPX & GP version-R 2.0-liter V-6 MIVEC DOHC engine makes 200 horsepower, GR & GX Sports Package 2.0-liter V-6 DOHC engine makes 180 horsepower, GS 1.8-liter l-4 SOHC engine makes 125 horsepower. 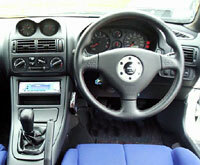 In 1997, GPX & GP version-R & GX Sports Package models got a new INVECS-2 sports-mode 5A/T. All FTO have nimble handling, good grip, and quick, accurate steering. 1999 Mitsubishi FTO GS : Four wheel disc brakes (rear V-discs), ABS, 185/70R14 tires, Electric colored door mirrors, Sports seats, Air conditioning, Driver SRS airbag, High mounted stop lamp, Power steering. 1999 Mitsubishi FTO GR adds to GS : 195/60R15 tires, Keyless entry unlock. 1999 Mitsubishi FTO GX Sports Package adds to GR : 205/50R16 tires, 16-inches alloy wheels, Rear spoiler, Auto air conditioning, MOMO leather wrapped steering wheel, Driver and passenger SRS airbags. 1999 FTO GPX adds to GX Sports package : four wheel disc brakes (large type), Discharged head lamp, Fog lamps.